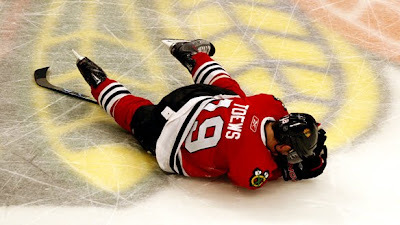 Are the Chicago Blackhawks the NHL's version of the Florida Marlins? Win it all... then sell it all? The ticket tape had not even been swept up in Chicago before the Hawks began shipping out some key cogs to their championship run. Dustin Byfuglien, Ben Eager, Brent Sopel, Andrew Ladd and prospect Akim Aliu now are in Atlanta. Colin Fraser was sent to Edmonton; and Kris Versteeg traded to Toronto. Even super-sub Adam Burish had to be let go. After sending six players packing from last season's Cup winning roster, Chicago had a bit more room under the cap, but only 14 players signed. Then came the next blow. San Jose signed shot blocking defensive specialist Niklas Hjalmarsson to a 4-year, $14 million offer sheet. Unwilling to accept 1st and 3rd round draft selections in return, Chicago was forced to match the Sharks' offer to Hjalmarsson and take on his $3.5 million cap hit. Bye, bye cap room. Now with 15 roster players signed, Chicago has $113k under the cap to add 2 defensemen, 4 forwards and a goaltender. Cup winning backstop Antti Niemi is a RFA, and is one of their top prospects, forward Jack Skille. Their UFA regulars include John Madden, Nick Boynton and Jordan Hendry might as well be forgotten. All of this means that more moves will have to happen. Even if they take the easy business, but difficult union relations option of burying "backup" goaltender Cristobal Huet in the AHL (or overseas), the Hawks will only have a little more than $5.7 million to sign 8 players including covering the cost of a pair of netminders. Absolutely no one should be willing to take on Brian Campbell's monstrous salary, so the next two likely candidates to be moved would be Dave Bolland and/or Patrick Sharp. The team has repeatedly thwarted all notions of moving Sharp, but they may just be forced to do it. The good news for Chicago fans: They won the Cup, and have their big four intact, but it ain't looking good for a repeat. Hockey's S.O.P. - Same Old Prejudices?